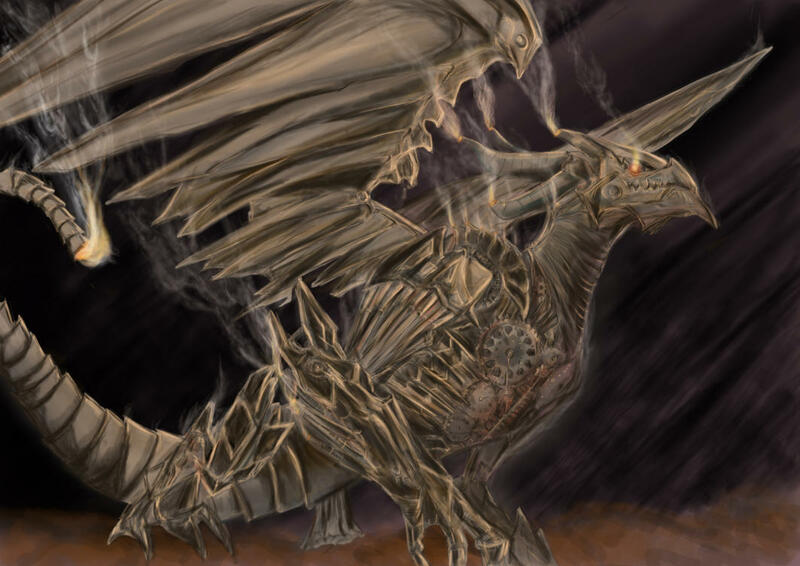 Abilities: The Clockwork Dragon, as its name suggests, is a demonic being which is partly composed of spirit energy, and partly built from mechanical parts. Designed by Pupus under command from Legion to construct a guard for the Miasmic Complex, the puppeteer went above and beyond what his master expected of him. Its body is impenetrable by most known weaponry, as well as large enough to crush those which would attempt to stand before it. The beast stands at 16 feet tall, and weighs upwards to 200,000 pounds. Its wingspan is 35 feet, giving it amazing speed as it soars through the harsh air of the Enclaves, peeking at 155 miles per hour. While it is slower on land, the most of its walking speed due to its large strides, it is not incapable of combat while on the ground. Flames constantly bellow from the dragon's jowls, and it is able to release them in cone-shaped bursts which have a range of 20 feet. It is also able to launch electric blasts from its tail, the end of which resembles a cannon. Miscellaneous Notes: - The Clockwork Dragon does eat all sorts of things, but its primary diet consists of tar and precious metals. - Only one has been completed, but it is entirely possible for Pupus to produce more if it is so requested by Legion or Lucifer.